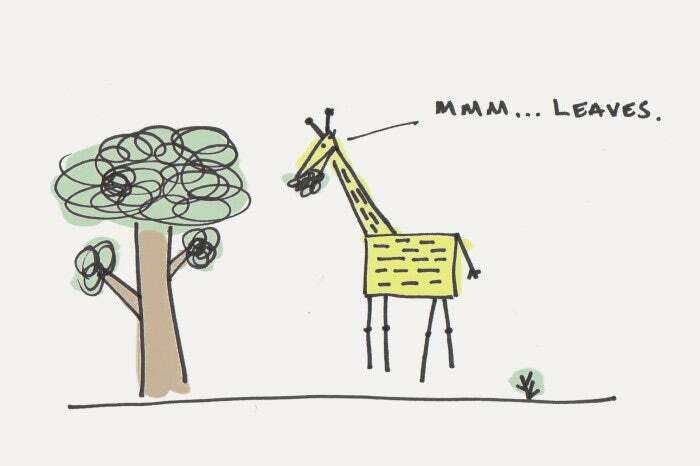 On any given day, most of your choices as a giraffe -- like what to eat or where to sleep or when to avoid a predator -- make an immediate impact on your life. You live in what researchers call an Immediate Return Environment because your actions deliver immediate benefits. Your life is strongly oriented toward the present moment. Now, let’s flip the script and pretend you are one of the humans vacationing on safari. 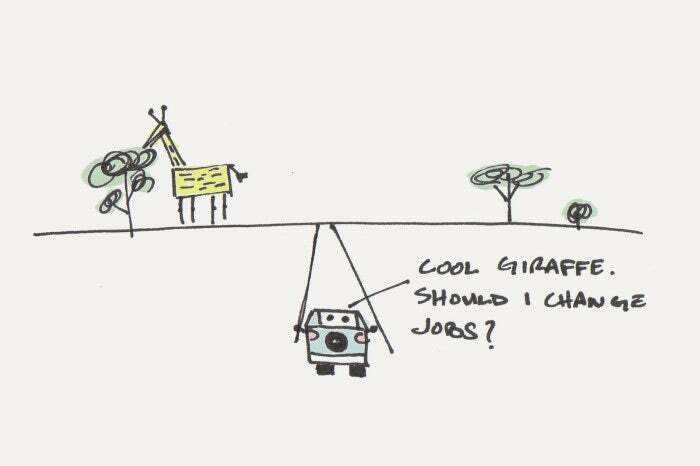 Unlike the giraffe, humans live in what researchers call a Delayed Return Environment. Most of the choices you make today will not benefit you immediately. If you do a good job at work today, you’ll get a paycheck in a few weeks. If you save money now, you’ll have enough for retirement later. Many aspects of modern society are designed to delay rewards until some point in the future. Unfortunately, living in a Delayed Return Environment tends to lead to chronic stress and anxiety for humans. Why? Because your brain wasn’t designed to solve the problems of a Delayed Return Environment. The earliest remains of modern humans -- known as Homo sapiens sapiens -- are approximately 200,000 years old. These were the first humans to have a brain relatively similar to yours. 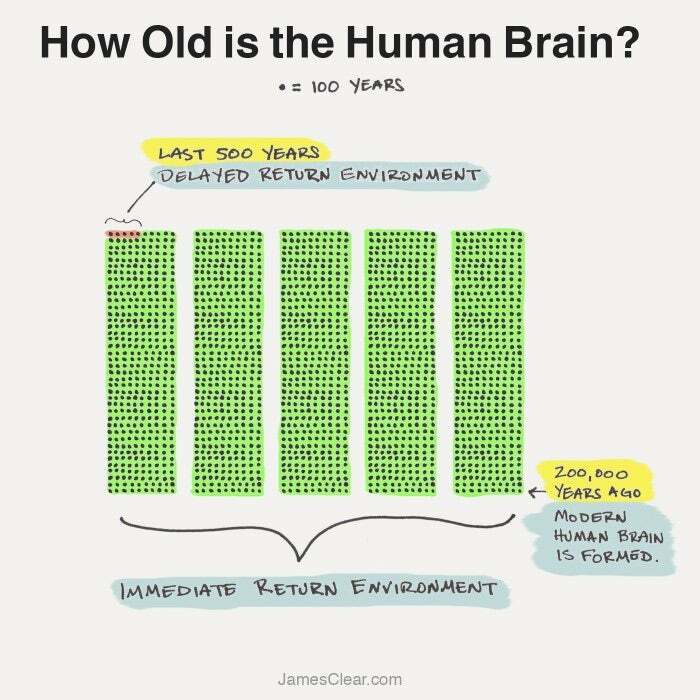 In particular, the neocortex -- the newest part of the brain and the part responsible for higher functions like language -- was roughly the same size 200,000 years ago as it is today. Compared to the age of the brain, modern society is incredibly new. It is only recently -- during the last 500 years or so -- that our society has shifted to a predominantly Delayed Return Environment. The pace of change has increased exponentially compared to prehistoric times. In the last 100 years we have seen the rise of the car, the airplane, the television, the personal computer, the Internet, and Beyonce. Nearly everything that makes up your daily life has been created in a very small window of time. You haven’t drank any water today > you feel stressed and dehydrated > you find water > your stress is relieved. This is how your brain evolved to use worry, anxiety, and stress. Anxiety was an emotion that helped protect humans in an Immediate Return Environment. It was built for solving short-term, acute problems. There was no such thing as chronic stress because there aren’t really chronic problems in an Immediate Return Environment. Wild animals rarely experience chronic stress. As Duke University professor Mark Leary put it, “A deer may be startled by a loud noise and take off through the forest, but as soon as the threat is gone, the deer immediately calms down and starts grazing. And it doesn’t appear to be tied in knots the way that many people are.” When you live in an Immediate Return Environment, you only have to worry about acute stressors. Once the threat is gone, the anxiety subsides. The first thing you can do is measure something. You can’t know for certain how much money you will have in retirement, but you can remove some uncertainty from the situation by measuring how much you save each month. You can’t be sure that you’ll get a job after graduation, but you can track how often you reach out to companies about internships. You can’t predict when you find love, but you can pay attention to how many times you introduce yourself to someone new. If you’re looking for good measurement strategies, I suggest using something simple like The Paper Clip Strategy for tracking repetitive, daily actions and something like The Seinfeld Strategy for tracking long-term behaviors. Our brains didn’t evolve in a Delayed Return Environment, but that’s where we find ourselves today. My hope is that by measuring the things that are important to you and shifting your worry to daily practices that pay off in the long-run, you can reduce some of the uncertainty and chronic stress that is inherent in modern society.